Help us reach our goal of completing the Hackley Stadium Renovation in its entirety. We rely on the support of those who are able to give their time or monetary gifts. Some of the work that is done at the stadium is done with donations as the schools budget has been cut in all areas. The press box is in constant need of repairs and paint, and we continue to try and keep it looking good. The major work is usually tied to a bond vote which helps with the infrastructure and building renovations. Artificial turf is still a dream to have at Hackley, but unfortunately, this may take some time. Again it would require a bond vote, one huge donor, or thousands of monetary donations from the Big Red faithful like yourselves. The athletes and the coaching staff deserve turf as they continue their winning ways, something that we have come to expect from this program. The cost of turf is significant. It can range from $740,000 to one million dollars, but we are still hopeful that one day this will happen at Historic Hackley Stadium. 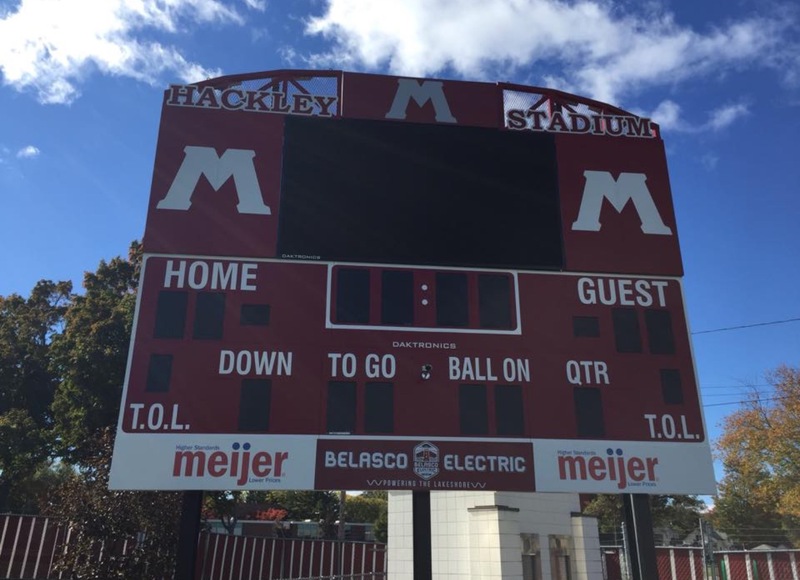 The Big Red video scoreboard is the newest addition to historic Hackley Stadium. After a lot of hard work and planning the completion of the board came to fruition in late August 2015. The board has been a huge high lite to the excitement of Friday night football at Hackley Stadium. It has the ability to showcase individual players, statics, and it also is has been used to thank the many of you who have been so helpfulin this project. The board also has been used for advertising and other celebratory events. It can do almost anything that you can imagine. It also has included a new public address system, along with the ability to play music during warm-ups and periods of downtime. The Foundation Board is still looking for donations to help with the final costs of this wonderful edition to Hackley Stadiums history. If you are willing to help, please click on donate and you can make a pledge on our secure fundraising site. And please mention this to your friends and ask them to help in this matter as well. Without people like you, this video board would never have happened. Thank you all so much! A big thank you goes out to Athletic Foundation President Terri Clock and Secretary Carrie Ernvall-Chase who worked feverishly to make sure the video board was up and running and still oversee its function at every event. New scoreboard at Hackley Stadium in honor of the late Carol Potter, wife of former coach and athletic director, Harry Potter. Carol was a founding member of the Foundation. 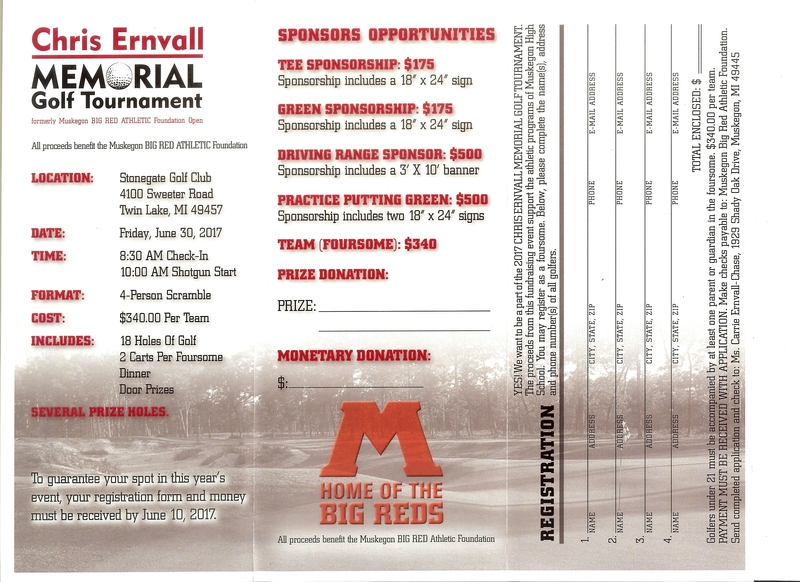 Funding for the book, "100 Years of Muskegon Big Red Football"
The 2019 Chris Ernvall Memorial Golf Outing will be held Friday, June 28, 2019, at Stonegate Golf Club. Please email bigredathleticfoundation@gmail.com if you would like to register to play in this event, sponsor this event, or make a donation.